Microsoft frequently rolls out small changes to Outlook on the Web, so the exact wording and location of the items mentioned in the procedure below may have shifted a bit. Go to outlook.cornell.edu and log in with your NetID and password. In the red toolbar, click the gear icon. Under My app settings, click Mail. 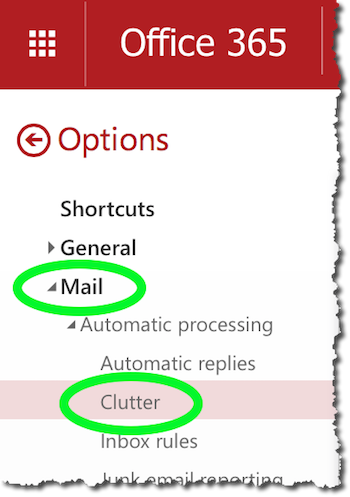 In the Options column on the left, click Mail, then select Clutter. To turn Clutter on or off, check or uncheck Separate items identified as clutter. When Clutter is turned on, you can choose whether or not to receive Clutter notifications by checking or unchecking Send me notifications about messages that are separated as clutter. Some email messages are very important; some are clearly junk. In between there is a range of messages that aren't totally without value, but can be a distraction from the most important things we need to focus on. These emails can be considered "clutter," which is also the name Microsoft has given a feature to move less important messages out of the way so that we can attend to vital emails first. Clutter "learns" how to make your inbox easier to navigate. As it learns the types of message you're more likely to consider clutter (either by you marking them as so, dragging them to the Clutter folder, or some other demonstration that they're not very important), it begins to deliver messages like that to the Clutter folder. You can examine the Clutter folder anytime, or once you're satisfied that Clutter has a good understanding of your email preferences, you can wait for a weekly summary of what went into Clutter, delivered to your email. When Clutter thinks it has found a new type of message that isn't important to you, it will send an email to let you know and verify that it's classifying things correctly. When it doesn't, you can move the message back to your inbox or mark it as not being Clutter, and the system will make note and be more accurate from then on. As time goes by, Clutter should become better able to anticipate what you consider unimportant. If you allow the system some time to build these patterns, you may see the sort of improvement that occurred when web search services started becoming better able to distinguish websites that have a lot of value from sites that have little. Clutter doesn't seem to be doing much. Is something wrong? Because Clutter monitors inbox activity, it can take some time to start working, depending on how much email you get. Also, Clutter's ability to discern less-important email can have a harder time focusing when email is handled in certain ways. For example, if someone opens and looks at every piece of email, regardless of whether they think it's important or not, Clutter won't be able to use the opening and reading of email as a measure. Is there anything I can do to increase the number of things that go into the Clutter folder? 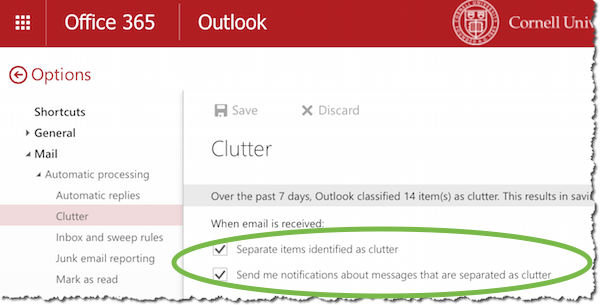 To help train the system to recognize a new type of mail as Clutter, move it into the Clutter folder. Other signals Clutter watches for are messages being deleted immediately upon being received or messages never being opened. Are there any factors that make a message less likely to be classified as Clutter? And if something is classified as clutter and shouldn't be, what should I do? Interacting with an email, for example by opening and reading it, indicates to Clutter that it's important. If you reply to an email, that sends an even stronger indicator. If something ends up in your Clutter folder that should be in your inbox, just move it back. Clutter will make note of this and attempt to be more accurate in the future. Is Clutter a good fit for my email? In general, the people that Clutter will help the most get a lot of email, and a share of it is made up of messages that don't need to be looked at right away. This is even more the case if those unimportant messages interfere with you seeing more important messages. If you don't get much email, and pretty much everything you get is important, Clutter might not provide many advantages. I mark messages that I need to take action on as unread, even though I have read them. Will this interfere with Clutter? While we don't have detailed information about how Microsoft has designed Clutter, since one of the things the feature watches is the read/unread status of an email, there is the possibility that marking an important email as unread might send mixed signals. If you use this method of tracking emails, you might want to consider turning Clutter off. How do Rules and Clutter interact? Rules take precedence over Clutter. If you have a rule to move a type of message out of your inbox, Clutter will not interact with it. Isn't Clutter just another type of junk mail processing? Junk mail processing is general across the system and is intended to remove inappropriate or dangerous email. Clutter is specific to you, and moves less-important email to the side for later viewing, so that it doesn't get in the way of more-important messages.